Wonderful flowing curves and fine detailing to carved profiles makes this a winning design. Sit down and admire. 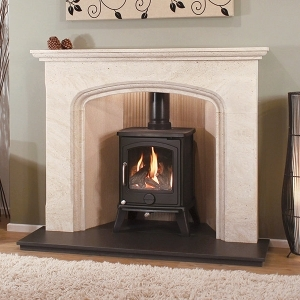 Shown with, Vista Quente, multi fuel stove and Reeded pattern design to Vermiculite chamber. The Barcelona fireplace incorporates a honed black granite hearth, however we can supply with a matching stone hearth if so desired. The Vermiculite Reeded patterned chamber is also available in the following designs, Herringbone Brick design, Brick Bond design, and Stone design. There is the option to select any of these designs enabling you to mix and match to your choice.